FEDERAL MONITORING & INVESTIGATION SEEKING TO WIRETAP INTERNET. Attention: Beneficiary,:- . . . Your Info. has been programmed for security. City you sent the fee from? City / Country:- Abuja- Nigeria. Meanwhile, we will advise that the Adhoc Committee should be confirmed immediately with the fee and request that they attend to your delivery as directed WITH IMMEDIATE EFFECT, To this effect, you are required to reconfirm below with the payment information. 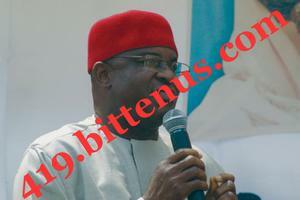 F. Dr. David Mark, GCON. This is an official email from the Nigeria Government we just Approval and instruct our CENTRAL BANK to issue a INTERNATIONAL BANK DRAFT CHECK value the sum of $950 000.00 usd, we are in contact to you because the insult the UNITED NATION ORGANIZATION has been giving to this Country, Nigeria holding Asia citizen funds. We don' t want any more trouble or problem my dear friend your funds has been hand over to a well know diplomatic agent who still complain about your not ready to claim your Funds from him. Nigeria as a country don' t want anymore insult from the World Government bodies, The United Nation are more concern about your funds still in Nigeria Country, we advice you because any more delay, we the Government of Nigeria will hold meeting with the United Nation bodies, to inform them about you the beneficiary not ready to claim he s funds. We don' t want any one to give our Country name, so therefore claim your funds out now before it will be too late.